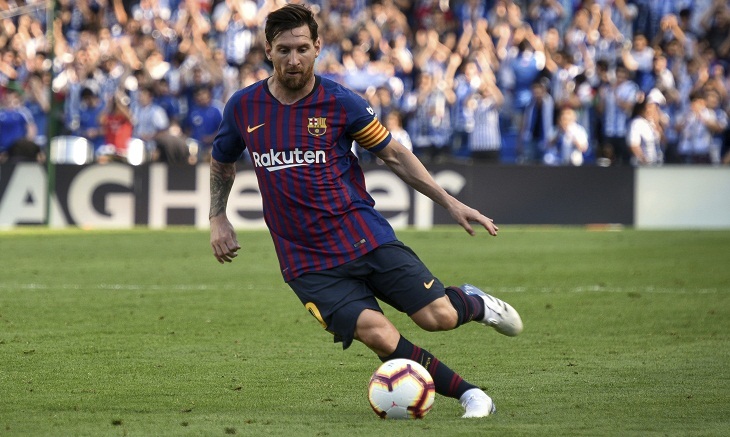 Barcelona helps to usher in a new-look to the Champions League on Tuesday as fans adjust to new staggered kickoff times. Most matches in the group stage will now begin simultaneously at 2100 GMT, 15 minutes later than in previous seasons. That is to accommodate a couple of games being played in a new earlier slot of 1855 CET to maximize television audiences. So when the group stage begins on Tuesday it won't be such a late finish at the Camp Nou for Barcelona's game against PSV Eindhoven or at the San Siro where Inter Milan plays Tottenham. Inter benefited from the fourth-place teams in England, Germany, Spain and Italy now securing a direct route into the group stage, rather than having to contest a playoff. None of the quartet reached the knockout phase last season. It was considered a debacle for Atletico, which had made at least the quarterfinals for four successive seasons, including two finals. Diego Simeone's team still made the best of a bad situation, though, dropping into the Europa League and winning the second-tier competition. But Atletico has labored at the start of its domestic campaign, winning only one of four La Liga matches. There is a greater incentive for Atletico to reach the final because it is hosting the game in June. The journey begins with a trip to Monaco, which is also struggling in the domestic league, with just one win from five in France. Like Monaco, Borussia Dortmund only collected two points in the group stage last season. But Lucien Favre's team is unbeaten so far in the Bundesliga with two wins from three as it prepares to travel to Belgium to face Club Brugge. Back in the Champions League group stage after a 13-year absence, Brugge has had the best preparation at home by winning six and drawing once so far in the league. Lionel Messi's Barcelona has had to endure seeing archrival Real Madrid win three Champions League finals in a row. Beating Madrid to the La Liga title did little to banish the humiliation of Barcelona's quarterfinal exit in Europe last year. There is unfinished business for the five-time European champions after throwing away a 4-1 lead over Roma by losing 3-0 in the second leg. Barcelona must return to Italy to play Inter Milan, which is back in the continent's premier competition after a seven-season absence. The three-time European champions have experienced a fall from grace since winning the treble under Jose Mourinho in 2010, including the Champions League title. PSV Eindhoven coach Mark van Bommel has an early return to Barcelona where he won the Champions as a player in 2006. PSV is in the group stage for the 16th time but the Dutch club's only success in the continental competition came before the inception of the Champions League when it lifted the European Cup in 1988. Tottenham is the only team in the group yet to collect the trophy but has been the most consistent side over three seasons in the Premier League, without actually winning the title, ensuring a hat trick of Champions League appearances for the first time. After helping Paris Saint-Germain re-establish domestic dominance last year, Neymar has little to prove with the club apart from achieving the big mission: Delivering a European title to the Qatari ownership. With Kylian Mbappe coming off the back of a starring role for winners France at the World Cup, new coach Thomas Tuchel has a wealth of attacking options. PSG will meet one of the few teams in the competition which can rival its talent: Liverpool, which lost to Madrid in last season's final. Flush with more than $200 million in off-season signings, Liverpool has an early test of its credentials when it hosts PSG at Anfield. Serbian champion Red Star Belgrade is making its first appearance in the Champions League proper after last contesting the European Cup group stage in 1991 as holders. Napoli, which won the 1989 UEFA Cup for its only European title, has a Champions League winner in the dugout. The Serie A club is still adapting to the command of Carlo Ancelotti, who replaced Maurizio Sarri and has introduced a 4-4-2 formation. Porto, the last team to win the Champions League from outside Europe's top four leagues, is the favorite to progress from arguably the weakest of the eight groups. Porto's opponents are returning to the Champions League group stage after some time away: Galatasaray is back after three seasons, four for Schalke and 15 for Lokomotiv Moscow. Winning the Russian title meant the Railwaymen were seeded first for the group, but they should not be considered favorites to top the group. Despite starting their domestic season poorly, the Russians have players with big-game experience - particularly recent World Cup finalist Vedran Corluka of Croatia.